Pastrima, pastramă, pastróme, PASTRAMI… to understand what pastrami really is we need to travel back in time. 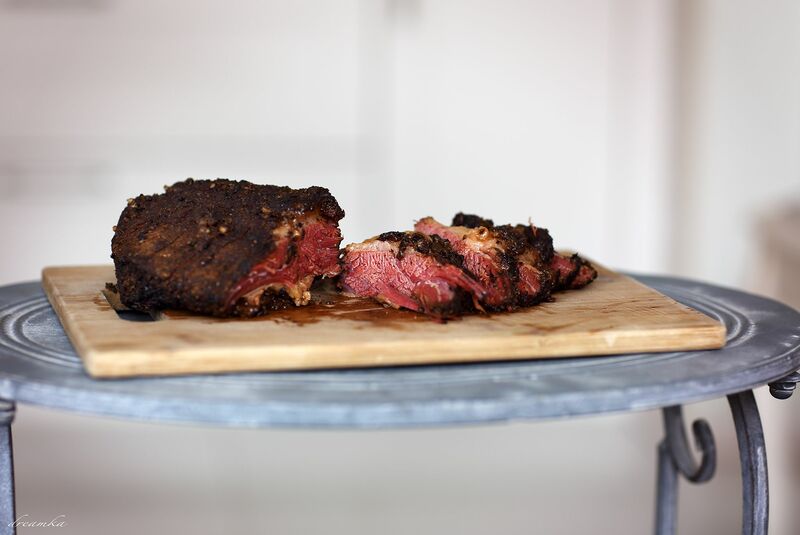 Although today’s meaning of the word ‘pastrami’ is ‘long cured and smoked beef brisket,’ probably it originally meant the way of storing and preserving meat, used by our ancestors before the refrigerator was invented. Back then salt was the key ingredient contributing to the safe storing of the meat for a long time. It was used to protect the cut meat of all kinds, starting form beef, through pork, lamb ending with poultry or fish. Presumably the English word ‘pastrami’ came to the United States together with the wave of Jewish immigration from the area of today’s Romania and Bessarabia, in the second half of 19th century. Romanian Jews who came to New York at that time, made pastrami from goose breast, which were quite cheap. Beef brisket turned out to be cheaper, though and with time the inexpensive beef replaced goose meat in the process of pastrami making. In 1887 a New York butcher, Lithuanian immigrant, served the first pastrami sandwich in his slaughterhouse. The sandwich was such a success that the man changed the slaughterhouse into a restaurant to sell pastrami sandwiches. It is the USA where pastrami is made in biggest quantities. Legendary restaurants, like Katz’s Delicatessen in New York serve the biggest and for many already cult pastrami sandwiches. Many chain restaurants create their own sandwich variations and sell them successfully. Recently however, the return to the tradition can be seen. To lower the costs, the commercial production of pastrami is not entirely based on old original recipes, which include long marinating, proper combination of spices and restraining from acceleration of production process. In the USA today there is a growing number of enthusiasts of curing and smoking beef brisket based on original recipes. And many Jewish delicatessen sell traditional pastrami. We aspired to create pastrami based on available traditional recipes, and although the product is made in a commercial manufacturing facility, the process of making pastrami is done in a very conservative way.